Jaisalmer Fort is the most prominent landmark in Jaisalmer city. Buit in 1156 AD, by the then king Rawal Jaisal, the fort has nearly a 1000 years of history. The smartly selected colour of the fort walls sync very well with the desert and make it difficult to spot from a distance. Jaisalmer fort has 3 layers of protection against enemy. Centuries ago, it was just the fort in the desert and nothing around it, but as population grew, Jaisalmer City is growing all around the fort. We had a short visit to the fort. The current state of the fort is rather disturbing. As our convoy drove closer to Jaisalmer fort, the lack of maintenance around the fort exterior was a bit disturbing. There is no proper fencing and distancing the fort from day to day activities like traffic, people etc. (Watch first few seconds of the video below). As we got down the Fortuners, few rickshaw drivers pulled close offering to take us up into the fort. I ignored them and kept walking. As I walked near the entrance, as usual a bunch of people selling “Guide services” tried to get business from me. I ignored them and kept walking- few of them followed me to some distance, with comments like “Do you even know what to look for inside?”, “You will get lost inside”, “Try our services and give us any amount you please”… I didn’t repond and soon joined our group, where our hosts from Suryagarh had booked an expert guide to show us around. Seeing this guide, other ‘guides’ backed off. We were briefed quickly about the challenges faced by Jaisalmer fort. Unlike other heritage forts protected by ASI, Jaisalmer fort has huge population living inside its premises. (These people claim they inherited the right to live there from their great grand-parents who once used to serve the kings of the fort and hence were given accommodation inside the fort campus. Some of them are renting out their place to tourists to stay while others earn their living from tourists who visit Jaisalmer by offering wide range of tourist based activities. Jaisalmer fort doesn’t have proper drainage system and wasn’t built to handle the number of people it has today as permanent residents. Hence the fort premises are slowly deteriorating. Some efforts are being made with foreign funding to set up the drainage system and many organizers are requesting tourists not to stay in the fort and not to shop inside fort premises. If everyone does this, those running business inside the fort will be forced to move out. Jaisalmer fort has 3 layers or protection, marked by 3 main doors. Raja and Rani Mahal: Raja Mahal, meant for the king and other male leaders of the Royal family has a protruding balcony and bigger windows, while Rani Mahals had no balcony and had smaller windows. Rani Mahal or sometimes referred to as Janana is the residences of all royal women. Few of them had to sacrifice their lives under the then prevalent ‘Sati’ scheme, whenever their husband died. Palm impressions of such women still lies on the entrance of Rani Mahal. We didn’t go inside these mahals. The temples: There are multiple temples inside the fort. Some of these were built based on request from wealthy businessmen- the temples they built elsewhere in the desert were often attacked by decoits and enemies, hence they requested the king to have few temples built inside the fort, with offer to pay extra tax. These temples have intricate carvings all around and poojas are performed. Do watch the video for a walkaround. Havelis: Havelis were built inside fort premises by the then rich businessmen who were close to the ruler. Some of these have become tourist lodge now, few are open to tourists for free while one more, the best of the lot, can be visited by buying a ticket. Sankara Subramanian (who blogs at Beontheroad) who had arrived in Jaisalmer few days earlier and had already explored the fort campus showed us around and took us to a room on top of a haveli which ensured cool breeze. It was really a refreshing breeze in the hot desert. Whoever built these havelis centures ago were proper engineers. Then we explored the other Haveli- Kothari's Patwa Haveli, which had lots of ancient artifacts on display, including furniture, cloths, kitchenware and so on. From the fort this Haweli can be reached on foot or even by road through a circuitous path. Watch the video for a walkthrough of the havelis. Visiting these places inside and around the fort is a tricky task if you don't have a guide, as you can easily get lost in numerous small alleys inside the fort. The last and best part of the Jaisalmer fort visit was the rooftop view. 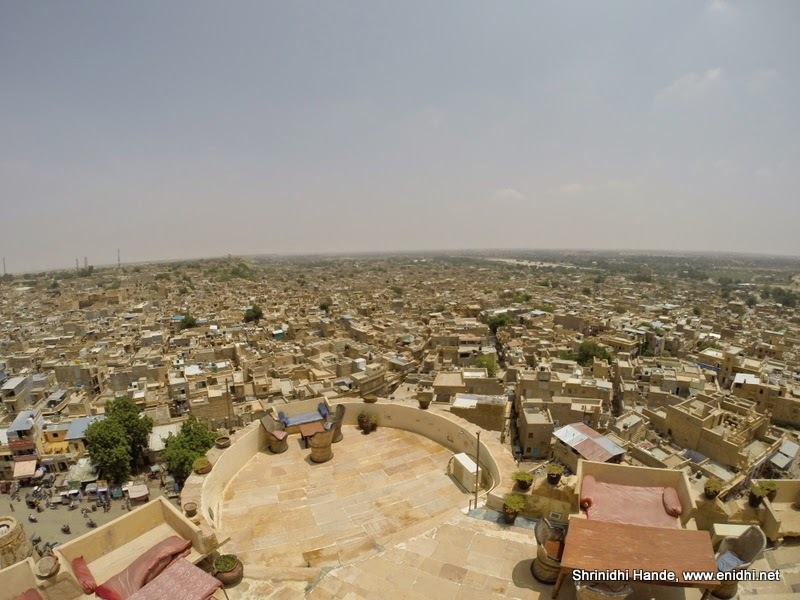 From top of the Haveli and from top of few other buildings, one can get scenic view of the Jaisalmer city and the fort. Below are some of the photos I could click. GoPro’s wide angle makes it even more viewable. Sankara said there were still better view points. Be sure to watch the video for close to 360 degree view. As informed by Anuradha Goyal in her comments, Jaisalmer fort is one of the UNESCO World Heritage site now (Added in 2013), while this gets some funds and increased tourist inflow, securing the campus and preserving it will continue to be a challenge. Reknowed Bengali director Satyajit Ray has also made a movie based on this Fort. Wow! This fort seems like an expansive one with numerous structures inside. Nice coverage. This is one of the few living forts in the world and now it is a part of UNESCO world heritage sites. I agree the maintenance can be much better. Nice coverage, samasyaen uthane ke liye aabhar. Video shandar hai.